Pentecost: Where Were the Disciples? The events that took place in Acts Chapter 2, where God poured out His spirit and empowered His small band of followers is the pivotal event in New Testament Christianity. Where did this amazing event take place? Most Christians assume that it took place in the upper room where the disciples had been staying. However, a closer look at the Text and some research into the historical setting of the Feast of Pentecost provides strong proof that the events of Pentecost actually took place in an entirely different location. Let’s see what the evidence shows. Luke 24:53 says that the disciples stayed continually at the Temple praising God. The Feast of Pentecost, or Shavuot in Hebrew, was just starting in Jerusalem as the book of Acts begins. It was one of the three great pilgrim feasts that every Jewish male was required to attend (see Deuteronomy 16:16). Where would these Jewish believers, who were continually in the Temple Courts anyway, have been on the first day of the feast of Pentecost? They would have been at the Temple! Acts 2:6-12 states that huge crowds of people from every nation gathered to hear Peter speak. Where would there have been room for great crowds of people, who were in Jerusalem for the Feast of Pentecost, during the time of day that the Temple services would have been held? It would have had to have been somewhere in the Temple area, the only place where there would have been that much space! In Acts 2:15, Peter told the crowd gathered that it was 9:00 in the morning. This would have been the exact time for the morning Pentecost service in the Temple. Certainly the disciples and the crowd would have wanted to be present for the Pentecost services. In Acts 2:2, it says that the sound of a violent wind filled the whole house where they were sitting. The Temple is frequently called, “The House” in the Old Testament (see e.g. 2 Samuel 7:5). Even in Acts 7:47, the Temple is called, “The House”. The House where they were sitting was the Temple! Peter spoke of the Tomb of David as being there (Acts 2:29). 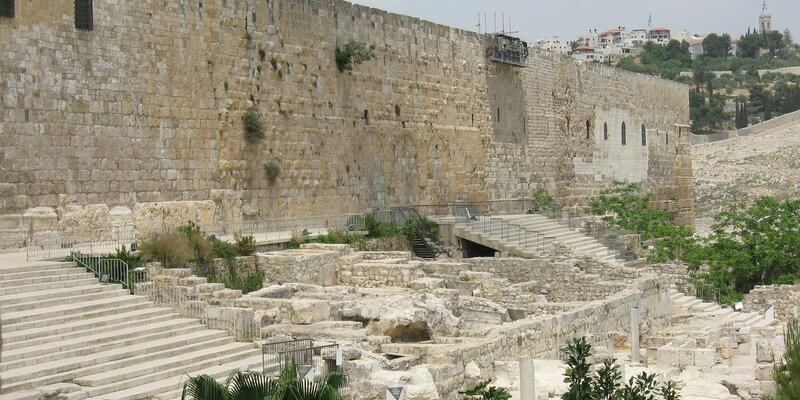 David was buried in the “City of David” (I Kings 2:10), which is the part of Jerusalem that is the closest to the Temple Mount. In Acts 2:41, it says that three thousand people were baptized in response to the apostles preaching. One of the only places in Jerusalem with that much water to baptize three thousand people would have been at the southern entrance to the Temple, where there were located numerous “mikvoth”. These were ritual baths used by the worshipers to ceremonially cleanse themselves before entering the grounds of the Temple. 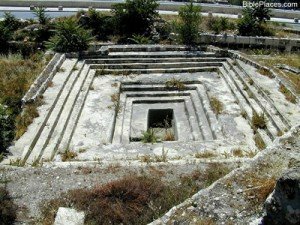 These pools, which already symbolized the removal of the uncleanness of sin, and their proximity to where the crowds would have been gathered, gives further evidence to Pentecost happening in or around the southern stair entrance to the Temple grounds. All this evidence overwhelmingly points to the events of Acts 2 taking place on or near the southern stair entrance to the Temple. Hundreds of thousands of God fearing Jews from all over the known world (Acst2:5) were gathered to celebrate the Jewish Feast of Shavuot (Leviticus 23:15-22). At this ancient Jewish feast, God came in the form of tongues of fire and settled on the new believers. God moved out of his old “House”, the Temple, and moved into a new “House”, the hearts of the believers. All of this took place in the framework of Old Testament prophecies that were fulfilled at this miraculous event and it all happened at the place God had his people build a place for Him to dwell! When the Holy Spirit came in the Pentecost story of Acts Chapter 2, the believers that the tongues of fire rested on began to speak in many other languages. “God fearing Jews from every nation under heaven”, heard the disciples speaking and declaring the wonders of God in their own native tongue. This was such a powerful and miraculous event that three thousand people believed in Jesus the Messiah and were baptized (read Acts 2:5-41). 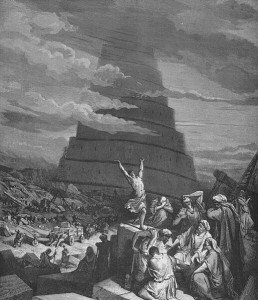 What I had never noticed before was that the events of this story are an exact reversal of the story in Genesis 11of the Tower of Babel! Up until the time of Genesis 11, the whole world had one language and a common speech. However, the people unified under a common, but sinful and egotistical purpose to try to build a staircase to God and to thus dominate all of creation. God punished the people by confusing their common language so that they couldn’t understand each other. Our English word babble comes directly from the Hebrew word in this story. Then he scattered the people from Babel all over the earth and from this scattering came all the different nations. At Pentecost, God reversed what He had done 2,500 years earlier. He brought together the same scattered nations that had different tongues and dialects and brought them back together so they could once again understand each other. On this occasion, they came together and were unified for the correct reason, to praise and exalt the God of the Universe. If you look further into the writings of the early Jewish rabbis there is even more to get excited about. Shabbat 88b in the Talmud says “God’s voice at Sinai was heard in all languages”. When God was giving His written Torah to Moses and the people at Mt. Sinai, something interesting happened. In Exodus 19:16, what the people heard was not, ”thunders”, as most translations have, but, “voices”, (the Hebrew word is kolot; see also They Many Parallels of Sinai and Pentecost)! Think for a minute how that ties into the Acts 2 story. Because of this, the Rabbis taught, that at Sinai, God’s great voice went out and was divided into seventy languages, with seventy being an editorial way of saying, all the nations. Now, at Pentecost, the praises of God are heard and understood by those same “seventy nations”, as one common language. To the Jewish audience, the events of Pentecost would have confirmed and fulfilled the rabbinical teachings they had heard for generations! I am continually amazed at how the Hebrew Text and the New Testament are so integrally intertwined. As someone once wrote, “The Old Testament is the New Testament concealed and the New Testament is the Old Testament Revealed”. Stories like these are real faith builders for the believer as they show how God intricately planned the Beginning and the End and everything in between, down to every jot and tittle. The Feast of Shavuot (pentēkostē in Greek, Pentecost in English), one of the three great pilgrim Feasts that God told the Jewish people to celebrate (Deuteronomy 16:16), occurs fifty days after the Feast of Pesach (Passover). This holiday, described in Leviticus 23:15-22, was primarily an agricultural festival and celebrated the end of the barley harvest and the beginning of the wheat harvest. However, very early in Jewish history, it also took on an even greater significance. 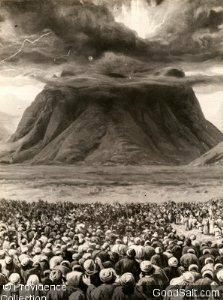 The Rabbis determined that the timing of the Feast of Shavuot coincided with the great event in Jewish History of God giving His Torah to Moses on Mt. Sinai. The Israelites left Egypt on the fifteenth day of the first month, the morning after the sacrifice of the Passover Lamb. They arrived at the foot of Mt. Sinai on the fist day of the third month (Exodus 19:1), which would have been approx 40 days. Moses then went up on Mt. Sinai and stayed there several days and then brought back down the two tablets written on stone by the finger of God. This total time-line closely approximated the fifty days after Passover that the Feast of Shavuot was supposed to be held on. Since Passover was an Exodus related feast as was Sukkot in the fall, the Jewish sages concurred that Shavuot must be Exodus related as well and was to celebrate the occasion in which God revealed Himself to His people and made a covenant with them by giving them His written instructions on how to live (Torah). Why is this of significance to Christians today? The great event described in Acts 2 in the New Testament, when the Holy Spirit appeared and rested as tongues of fire on individual believers, occurred on the Feast of Shavuot (Pentecost)! The same day that the Jews were celebrating God’s giving of His Torah on tablets of stone, the Holy Spirit came and wrote His Torah on people’s hearts! This confirmed God’s promise in Jeremiah 31:31-34 and was the promise from the Father that Jesus had told His disciples about in Acts 1:4. A look at these two seminal events in Bible history will reveal some remarkable parallels and similarities and will increase your faith in the awesome God of the Bible! God had planned the Acts 2 events even from the time of the Exodus and then He brought them to pass in the framework of the Jewish Feasts that had been set up 1200 years prior. While this is certainly not an exhaustive list, here are some amazing parallels between these two events that happened 1200 years apart, to the day! Both events happened to a newly redeemed people. The Exodus marked the birth of the Israelite nation while the Pentecost events recorded in Acts 2 marked the birth of Christianity. Both events involved God’s people receiving a gift-Torah and Spirit. The Israelites left Egypt on Passover and 40 days later arrived at Sinai. Then Moses went up on a mountain to see God (Mt. Sinai). Ten days later Moses came down with the Torah and the Israelites broke the covenant and 3000 people died as a result. Jesus died on Passover and 40 days later went up on a mountain to see God (Mt. Of Olives). Ten days after Jesus ascended, the Holy Spirit came down and 3000 people were saved! Fifty days after sacrificing Passover Lamb, the Israelites received a covenant from God50 days after sacrificing Jesus, Our Passover Lamb, believers received a new covenant from God. Both events had similar sounds and symbols-wind, fire, smoke, voices-the Hebrew word translated thunder in Exodus is “kolot” (Strong’s H6963), which means voices or languages. Think about this in light of the Acts 2 events. The fire at Sinai was one fire visible by all; the fire at Pentecost was individual fires on every person. In the event at Mt. Sinai, the people were kept away from the fire, but in Acts, the fire came to the people. In both events God gave His Torah (Law) to His People and in both cases He sealed the covenant that He had made with them. At Sinai He gave the Law written by His finger on tablets of stone. At Pentecost, He gave the Law written on Tablets of the Heart. In both events a mixed multitude of people were represented (Exodus 12:38 & Acts 2:5)13) The Torah attempted to change people from the outside (without). The Holy Spirit changes from within. The word “Torah” means teaching and in John 14:26 the Holy Spirit is called the teacher. Think about these parallels! Wouldn’t they have been powerful to the Jewish people that would have been there to celebrate this time long ago when God showed up in fire, wind, smoke and voices? Suddenly, it looks like God is showing up again in the same way that He came before! They see fire and smoke and hear voices and the place is shaking violently! God is back! What is He telling us? Looking at the history of Shavuot and what God did there makes the story of Acts so much deeper and increases our faith in the God of the Bible. His plans for us were made since the beginning of time and are exact down to the last detail. What a mighty God we serve!